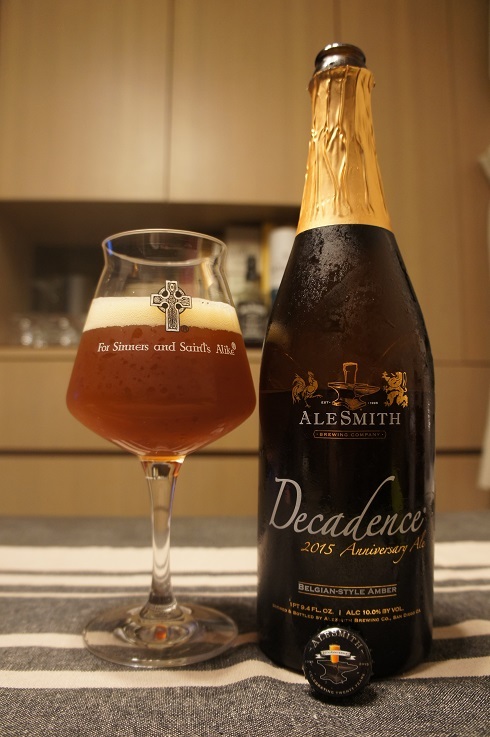 Brewer Description: (from bottle) AleSmith Decadence Anniversary Ale was originally brewed in 2005 to celebrate our first decade in business. 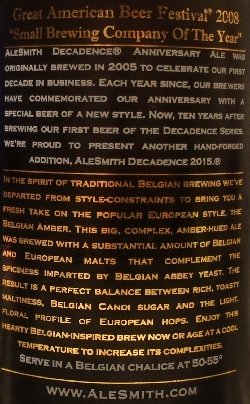 Each year since, our brewers have commemorated our anniversary with a special beer of a new style. 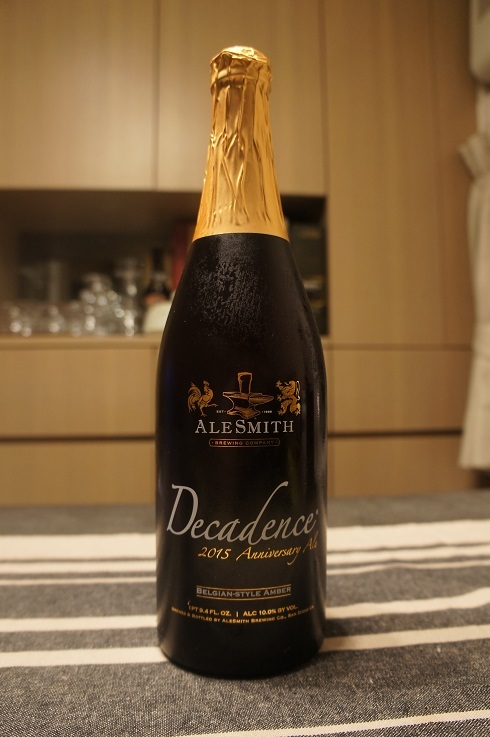 Now, ten years after brewing our first beer of the Decadence Series, we’re proud to present another hand-forged addition, AleSmith Decadence 2015. In the spirit of traditional Belgian brewing we’ve departed from style-constraints to bring you a fresh take on the popular European style, the Belgian Amber. 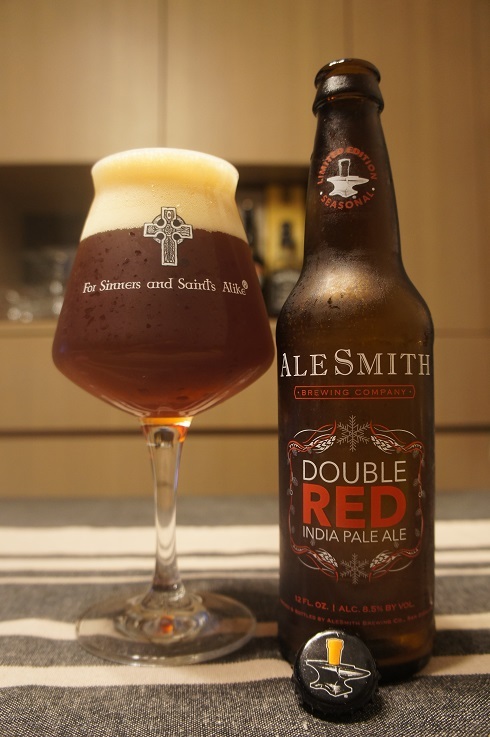 This big, complex, amber-hued ale was brewed with a substantial amount of Belgian and European malts that complement the spiciness imparted by Belgian Abbey yeast. The result is a perfect balance between rich, toasty maltiness, Belgian candi sugar and the light floral profile of European hops. Enjoy this hearty Belgian inspired brew now or age at a cool temperature to increase it’s complexities. Intro: A 1 pint 9.4 fl oz foiled bottle with no clear bottled on or best before date. Poured into a Lost Abbey teku glass. Brewer Description: (from bottle) Speedway Stout’s ominous, pitch-black appearance has become a hallmark of this modern-day classic. Chocolate and roasted malts dominate the flavor, supported by notes of dark fruit, toffee, and caramel. 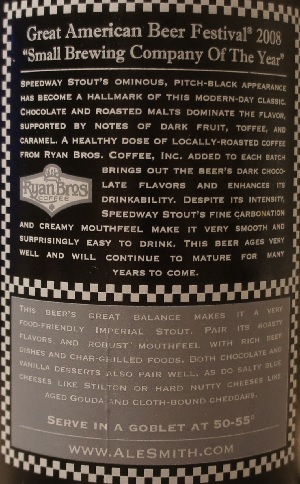 A healthy dose of locally-roasted coffee from Ryan Bros. Coffee, Inc. added to each batch brings out the beer’s dark chocolate flavors and enhances its drinkability. Despite its intensity, Speedway Stout’s fine carbonation and creamy mouthfeel make it very smooth and surprisingly easy to drink. This beer ages very well and will continue to mature for many years to come. Intro: A 750ml foiled bottle with no clear bottled on or best before date. Poured into a snifter glass. Appearance: Black in colour with a just over one finger tanned head that had good retention and left great lacing. Aroma: Roasty malts, dark chocolate, coffee, caramel with hints of vanilla and dark fruit. Taste: Follows the aroma with roasted malts, dark chocolate, caramel, toffee, vanilla, coffee and dark fruits. Mouthfeel: Creamy, velvety and smooth. Full bodied with light carbonation and light warming alcohol booze. 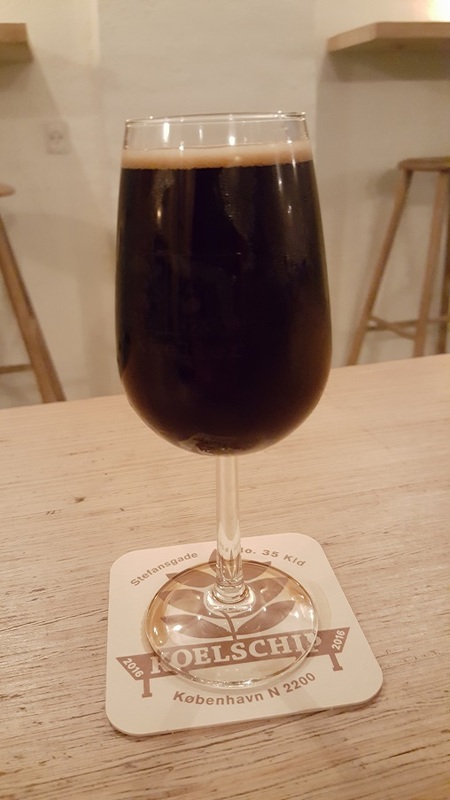 Overall: A very nice classic Imperial Stout. Very easy to drink with its nice coffee and chocolate flavours. 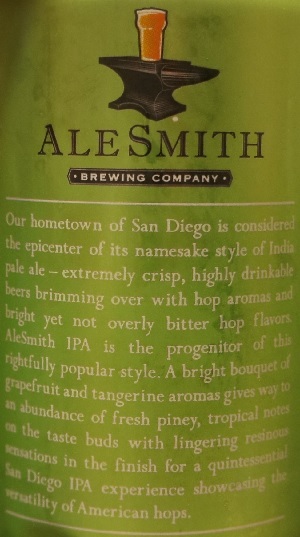 Brewer Description: (from can) Our hometown of San Diego is considered the epicenter of its namesake style of India Pale Ale – extremely crisp, highly drinkable beers brimming over with hop aromas and bright yet not overly bitter hop flavors. 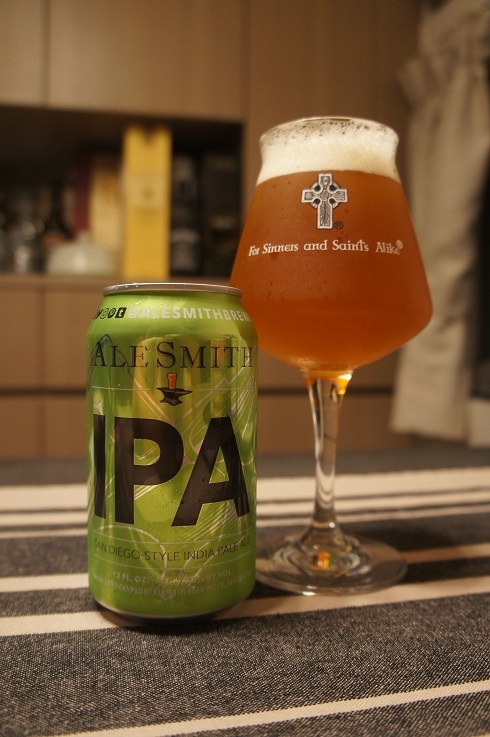 AleSmith IPA is the progenitor of this rightfully popular style. 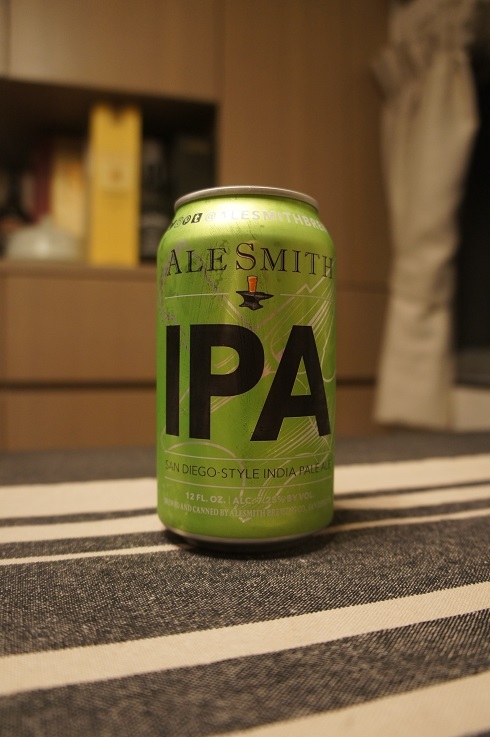 A bright bouquet of grapefruit and tangerine aromas gives way to an abundance of fresh piney, tropical notes on the taste buds with lingering resinous sensations in the finish for quintessential San Diego IPA experience showcasing the versatility of American hops. Intro: A 12 fl oz can, canned on 5th October 2016. Poured into a Lost Abbey teku glass. Appearance: A lightly hazy, light copper orange colour with a nice two finger off white head with good retention and great lacing. Aroma: Tropical pineapple and apricot with citrus orange, pine and sweet biscuit malt. Taste: Citrusy and bitter orange peel, mandarin and grapefruit followed by sweet-ish pineapple, biscuit malt and pine. The finish has a nice long resinous bitterness. 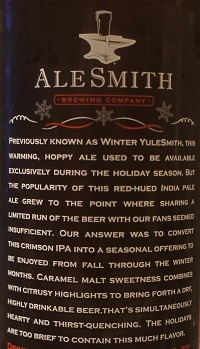 Mouthfeel: Crisp, dry-ish, medium bodied with moderate carbonation. Overall: A wonderfully tasty and balanced West Coast IPA. Also loving the cans! Brewer Description: (from website) Mirroring the coffee-house espresso-drink of the same name, Hammerhead Speedway Stout is a version of AleSmith’s world-renowned coffee imperial stout dosed with even more select java plus a heaping helping of espresso. 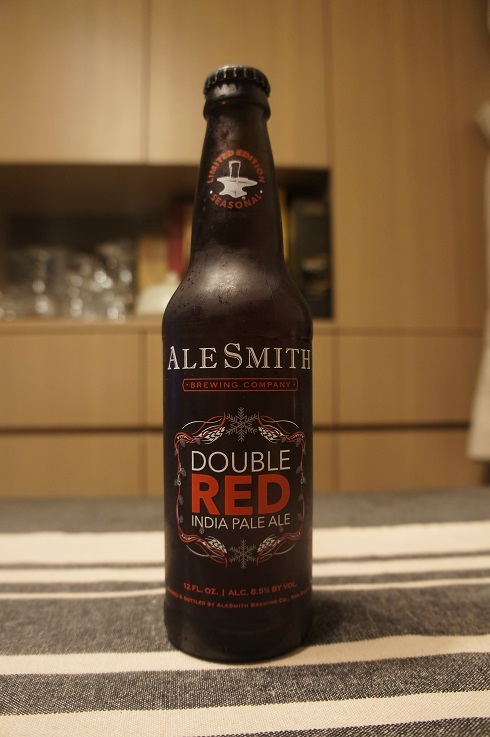 This highly caffeinated one-off was first brewed on an experimental basis as part of AleSmith’s popular Speedway Grand Prix event during the 2013 edition of San Diego Beer Week. 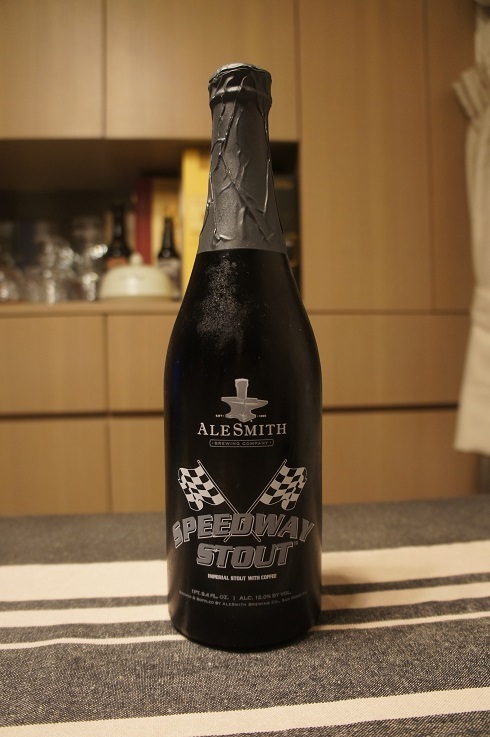 Introduced along with 11 other special versions of Speedway Stout, it was an instant classic and the all-around favorite of AleSmith fans. As such, we are immensely proud to bottle it for the very first time as the first in a family of future releases that will eventually tackle the beer’s much beloved offspring, Double Hammerhead Speedway Stout and, for the most insatiable Joe enthusiasts, Triple Hammerhead Speedway Stout. Appearance: It was a nice dark black colour with a one finger beige head with moderate retention and great lacing. Aroma: Dark chocolate, oak, vanilla, coffee and a touch of alcohol. Taste: Espresso, chocolate, vanilla, oak and dark fruit. Mouthfeel: Rich, full bodied with light carbonation. 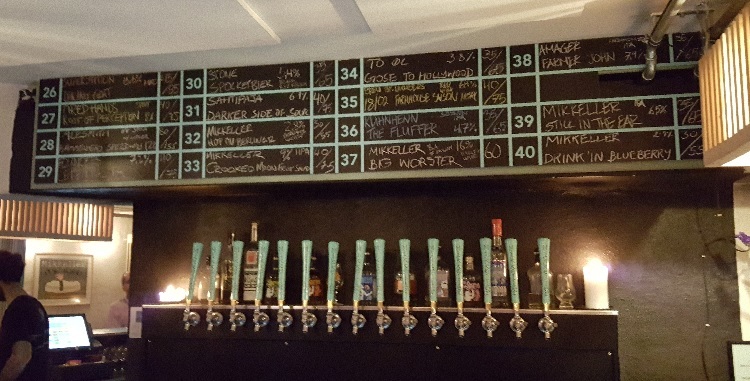 Overall: A very nice Imperial Stout and a great variant of the Speedway Stout.